Torchlight developers Runic Games have just released a lengthy gameplay video of Hob, their upcoming Zelda-like action RPG. 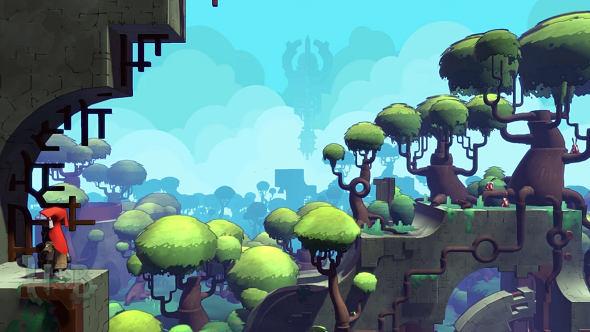 In the video, embedded above, Runic president Marsh Lefler and game director Patrick Blank take us through the game’s forest area, teasing a shifting alien world crammed with secrets. Keep an eye on our upcoming PC games feature if you don’t want to miss anything cool. Unlike Torchlight, Hob will be a custom adventure, with each environment poured over and created to take you on a journey through this unknowable, mute world. Inspired by games like Ico and Shadow of the Colossus, Hob features no dialogue or text – you just have to read the world to make progress, seeing your destination looming in the distance or taking notice of how the various wildlife traverses this landscape. Each area has a theme, or a look, with different lighting and colour palettes. The video here shows us the forest, but we’re also taken further up when a mechanical lever shifts the landscape around our hooded hero and he’s raised up to a darker woods filled with enemies. He’s equipped with a sword and a big, clunky arm which is actually an upgrade and requires energy to use. It’s all very Zelda-like, from the combat encounters to the way you can slice the long grass and grab health pickups. It’s super stylish, though, and has some incredible environments and some lovely little quirks in the animation – I love the way the little red dude stares at animals as they pass.